Donations/reward only under 50 miles; gas money over 50 miles. Married with one son. Just started into the hobby a couple of years ago and love it. Wow! What a weekend I had!! I went kayaking for a friend’s bachelorette party in the Hocking River. I ended up falling out of the kayak and losing my engagement ring, wedding ring, and my anniversary band in the river! I was completely devastated! After finishing up the river route, we went back to try to find my rings. The water was high and muddy, the currrent was fast, and it just felt like a lost cause. After returning home, I was searching online for some sort of way to attempt to find my rings. I came across this website. I thought it was a “shot in the dark” but definitely worth a try to get my rings back. I emailed Steve because he seemed to be the closest person to where I lost my rings. Within a half hour, he emailed me back. He said that he would love to try to find my rings and that he could meet me sometime THAT AFTERNOON!!! I was completely grateful that a complete stranger would be willing to take time out of his afternoon to come help me look for my rings. I believed that he was sent to me from God! We met at the canoe livery to go back to the area where I had fell out of the kayak. He was very professional and allowed me to show him where I was in the water before he began his search. As he was searching, all I could do was pray that he would be directed into the right area where my rings were lost. Then, a lady was coming down the river in a kayak and did exactly what I did in my kayak (except I fell out and she didn’t). I pointed that out to Steve and he went right to that area to continue his search. Immediately, he said,”Now, don’t get too excited but I have a really strong tone here in this area”. He took his scoop and scooped that area to check for my rings. 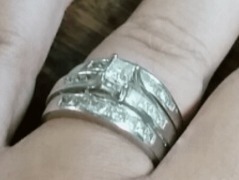 After scooping, he said, “Well, I still hear a tone there but since your rings are in two separate bands, I am gonna bring this one over to the sand bar (where I was standing)”. He dumped that scoop out and right on the top, fell my anniversary band. I was so completely overwhelmed with emotion that I grabbed the ring, put it on my finger, and began to scream and cry! Then, he said that he was going to go back to that same area because he still heard a tone there. He scooped again and brought it over to the sand bar to dump. After rummaging through the rocks and dirt of that scoop, I saw my engagement ring and wedding ring at the bottom of that pile!!!! I was so so grateful and excited that he found all of my rings that I put it on my hands, still dirty, and again screamed and cried! I was so happy!! Steve, then, asked to help me wash the rings before we left so that they would be clean again. I cannot thank this wonderful, God-sent angel enough for retrieving my rings for me!! I would definitely recommend this website, and especially Steve, to anyone looking for a chance to find their lost items! He is a great guy and truly enjoys this hobby of his!! Thank you again so much Steve for what you have done for me and my husband! This will be a story that we are going to tell everyone that we know so that we can spread how wonderful these people on this website can be!